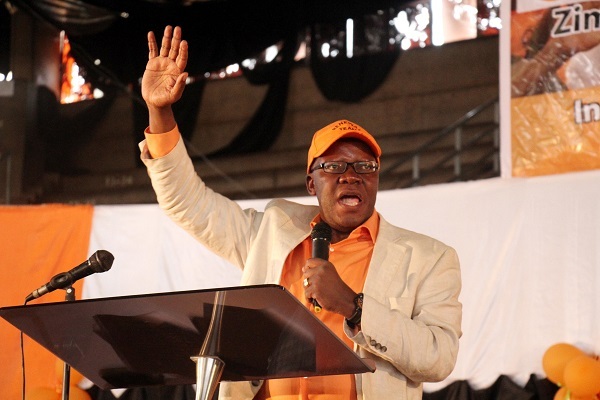 ZIMBABWE – Bulawayo Bureau — People’s Democratic Party (PDP) leader Mr Tendai Biti has conceded that Zanu-PF is the most popular party in the country despite the emergence of many opposition parties.Addressing a handful of PDP supporters at a rally held at a lodge in Gweru on Sunday, Mr Biti said the results of a survey conducted by the Mass Public Opinion Institute (MPOI) and released to the media recently, which noted that President Mugabe was popular, were authentic. The PDP leader said Zanu-PF is tactically superior, hence it defeated MDC-T in the 2013 harmonised elections. “We formed our party (PDP) so that we will have the last dance at a wedding. We are the fourth biggest party according to a survey conducted in June that also revealed that Zanu-PF was at the top. These other political parties being formed don’t command a meaningful following. We want to join hands with other parties on the basis of value and principle,” he said. Mr Biti took a swipe at MDC-T leader Morgan Tsvangirai for snubbing the burial of former Youth Deputy Minister Thamsanqa Mahlangu who died two weeks ago, saying that was a sign of lack of respect. “The MDC-T leader is selfish and people in his party no longer have confidence in him as their leader. Tsvangirai wants all leadership roles in the party to himself; he doesn’t want to give opportunities to other people to also lead, that is why I and other wise people left that party,” said Biti. His deputy, Samuel Sipepa Nkomo said the PDP party was going to form a coalition with small parties to map the way forward. “As PDP we are going to come in together with other small progressive parties to make a better Zimbabwe without corrupt leaders, with free and fair elections, full of development,” said Nkomo.